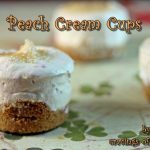 Every month I post with a wonderful group of bloggers called The Secret Recipe Club. Each month we all get assigned a different blog to visit and make something from. It’s such an amazing group as it opens you up to other blogs you may not have known about. It also encourages people to share the love which I am personally all about. I love the community of blogging so this group really is a good fit for me. I really enjoy participating. This month I was assigned the blog Sweet As Sugar Cookies. Lisa is a talented cook and has so many recipes to choose from it was hard to narrow down what I wanted to make. I kept going back to her Spicy Peach BBQ Sauce Chicken. The catch was I had just bought a monster size jar of peach bbq sauce while on our trip to St. Jacobs. But I still could not get the recipe out of my head. So I turned it into peach salsa. Hopefully Lisa likes the adaptation. I just could not help myself. Her peach sauce was stuck in my brain and had to be used. She also has some really amazing ice cream I’d love to try. Her meals are killer good and I’ve bookmarked a few of them to try when the heat lets up. So thanks to Lisa for the awesome inspiration today. Your sauce is so good I had dreams about it. A little tip before the recipe. If you don’t mise en place yet you must try. Not only is it pretty but its also useful. You have no idea how many times I go to make something and I realize I’m missing an ingredient in the midst of an important step. So if you mise en place you will be alerted ahead of time and can send your kids or hubby to the store. See, I’m a giver. Always looking out for others. 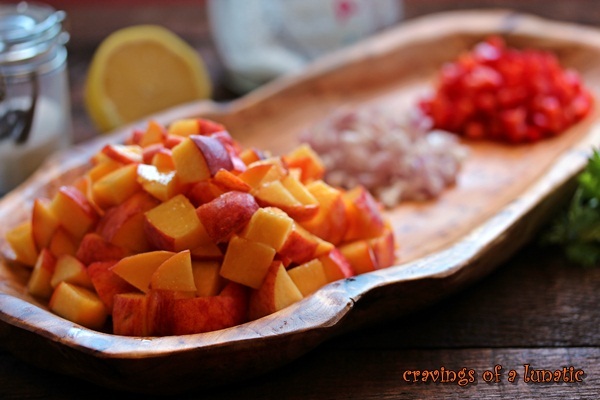 An easy and delicious peach salsa recipe you can use on fish, chicken, pork or beef. Cut up all your fruit and veggies. Pop everything but the cilantro in a bowl and mix it all up. Pop in the fridge for about 30 to 60 minutes to let the flavours meld together. Serve over top of fish, chicken, pork or beef. I know right, it’s gorgeous. I just want to eat it up with a spoon and forget putting it on top of anything. It’s a great recipe. I used lemon in mine but only because my limes seemed to have gone missing. They must be hiding out on the deck or something basking in the sun. Could not find them anywhere. So the lemon made the substitute. If I make it again, which I quite likely will I would use lime next time. If I can ever find my dang limes. Quick edit- thanks to a reader for noticing the links for the vanilla salt and vanilla sugar are missing. If you don’t have time to make either feel free to substitute regular sugar and regular salt. But personally I like making my own vanilla salt and my own vanilla sugar. Adds that extra oomph that I love. Thank you Susan Saunders for letting me know this was missing! Please make sure you stop by the other Secret Recipe Club members and check out what they made this month. 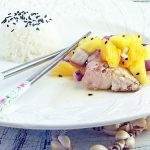 There’s some amazing blogs involved each month so you are sure to find some great recipes. 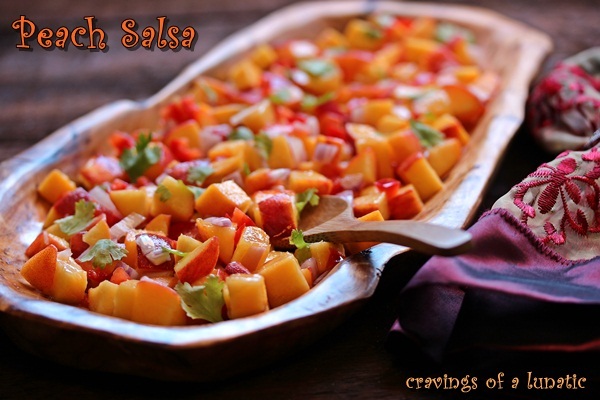 I adore peach salsa. this looks just perfect Kim! Thanks so much Cassie. I really love peaches more than life itself. I don’t care if it has lime juice, lemon juice or any juice; it looks amazing. I even have some tortilla chips. Just bring that bowl on over here and let’s have at it. Great choice for the recipe club! Yum, yum, yum! I agree…I think I would eat the salsa straight-up like a salad!!! I thought about doing just that. It’s so good. The peaches were perfectly ripe and the whole thing smelled amazing. that salsa looks so delicious! 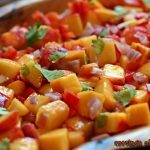 I’ve never had peach salsa but it looks and sounds incredible! Great adaptation on Lisa’s recipe! Thanks so much. I really love salsa on chicken in particular. It’s just so good. The smell of this one is out of this world. Yum! 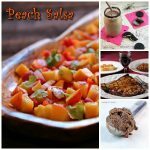 I love peach salsa. Looks great! I totally agree with you…. I just need a spoon!! Fresh and fantastic!! Thanks Ramona. I am loving this salsa way too much. Thanks so much. I had a blast making this one. It’s just so inviting and fresh. You are right this looks scrumptious but, as I have probably mentioned before, I am not keen on mixing fruit with savory. So I will just gaze on your lovely photos with admiration instead. I’m usually not keen on it either but this one worked really well. Loved it. Thanks Maureen. I usually don’t like stuff like this but this one was incredible. gorgeous choice for SRC…..looks delicious! Thanks so much Marina. I really enjoyed whipping this one up. Oooh, I love fruit salsa, but I haven’t made any in forever. This looks so good-what a great summer choice! You must change that Sara. Make some today. You will thank me. Lol. 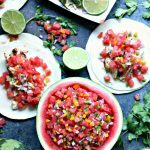 Kim, your peach salsa, is so refreshing, gorgeous, and colorful! 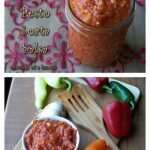 What an amazing job you did with this yummy salsa! you’re killing me girl! I’m so going to make it these days. I heart peaches! Mmm, that has summer written all over it! It really does. So summery and yummy. That is the pretty salsa that I’ve ever seen! I’ve been addicted to peaches lately, so luckily I always have a few in the house… and they will definitely need to be turned into salsa now! Awe thanks Kelsey. The peaches last week were killer good. Just hoping this weeks are as lovely. I ran out. I can’t stop eating them. 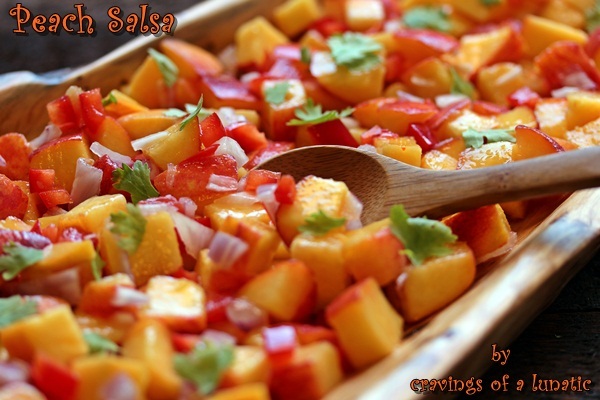 What a beautiful salsa! Great job, Kim! And I love the addition of cilantro. It really makes it “pop”. Thanks so much. I think this is just so much fun to make and eat. It’s too pretty for words. Mise en place definitely helps! 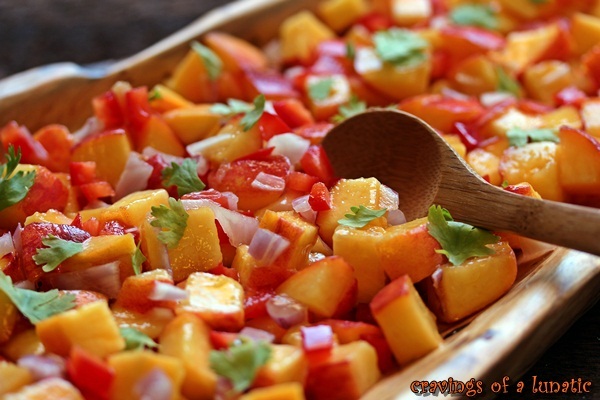 This peach salsa looks great! You did a great job on both the recipe swap and the SRC! Kudos to you for putting up different posts. I got lazy and just combined the two! It’s so important, I always regret it when I don’t do it. Thanks so much. I wish I had thought of that actually. Combining them would have been easier. Do you ever preserve it, or just eat it fresh. I could sit and eat a tub of it, I am sure. What are the variety of foods you serve it with? I’m not one to can things. I had a bad experience once and it’s put my off canning. I just make salsa fresh the day of or day before we want it. I put this on fish like a haddock or halibut, or chicken. I don’t eat pork often but it would be great on a pork tenderloin. 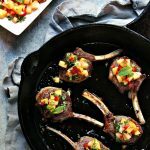 I’ve heard peach salsa is also good on beef but I’ve not tried that yet. 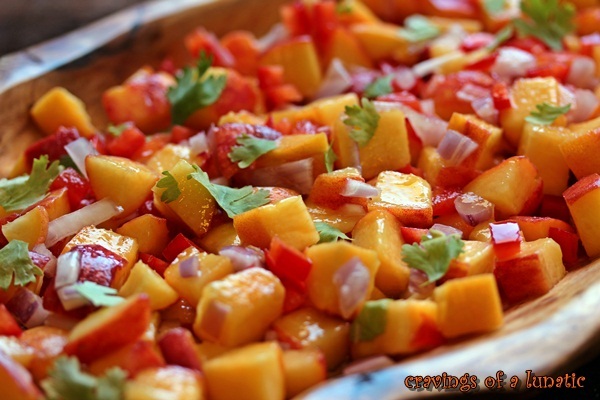 I love peach salsa. I always add a bit of jalapeno to mine, just because I love spicy. Vinegar too, sometimes. And it’s such a pretty dish! Great with chips, of course, but also with grilled meats and fish. Good post – thanks. I had jalapeno but was worried the kids might not like it. I should try that next time. I like a good kick. I am not a vinegar gal, no clue why. I’m addicted to buying the balsamics but then I never use them. Lol. Thanks so much. I love that you like this one. This looks so refreshingly fabulous! I just love it – such a perfect way to use a wonderful seasonal fruit. Thanks so much. I really loved making this one. it’s sort of redundant at this point but… yup. looks good. 😉 happy src reveal from a group d member! Your comment made me howl with laughter. I just tried it today. It tastes wonderful and totally gorgeous. Thank you for sharing!